Respironics announces the release of its new Mini Eliteâ„¢ Compressor Nebulizer System for active patients who want to take their aerosol treatments wherever or whenever. 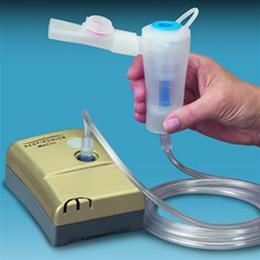 The small and lightweight Mini Elite compressor is easy-to-use and provides efficient nebulizer treatments. This stylish, elegant compressor provides portability and can be powered by three versatile power source options AC, car adapter and battery.